Every capsule wardrobe requires a basic tee, but basic needn’t be boring! 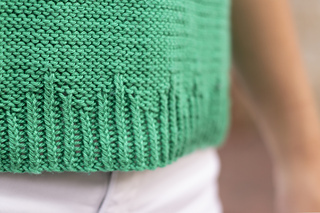 Twisted ribbing paired with a bold color choice make this top a joy to knit. Kelly has short dolman sleeves. Front and Back are knit flat from the bottom up.